Up until 2014, my only expressive creative outlet was music. I’m a self-taught pianist and I can also hold down a beat on the drums. I spent many years playing keyboards in a number of bands and it was during this time that I realised I had a love of art – Through hours spent designing posters, in an effort to drive people to attend some of our gigs. I’ve always felt I have a natural eye for taking a picture, but it wasn’t until 2013 (when I picked up my first Digital SLR camera) that I discovered the power of landscape photography as an art form. Prior to this, I had only ever used Point & Shoot cameras and smartphones to capture memories. All of a sudden, a potential for creative expression took complete hold of me! Inspired by winners of the Landscape Photographer Of The Year competition (Mark Littlejohn and Andy Farrer) and mentored by my good friend & exceptionally talented photographer, Jake Turner – I taught myself the skill of landscape photography. Living on the edge of The Cotswolds gives me easy access to many areas of outstanding natural beauty in the UK. Additionally, travel through Europe, the United States and Australia has enabled me with more opportunities to expand my portfolio even further. In September 2014, I had my first work published in 2 UK national newspapers; The Times & The Guardian. 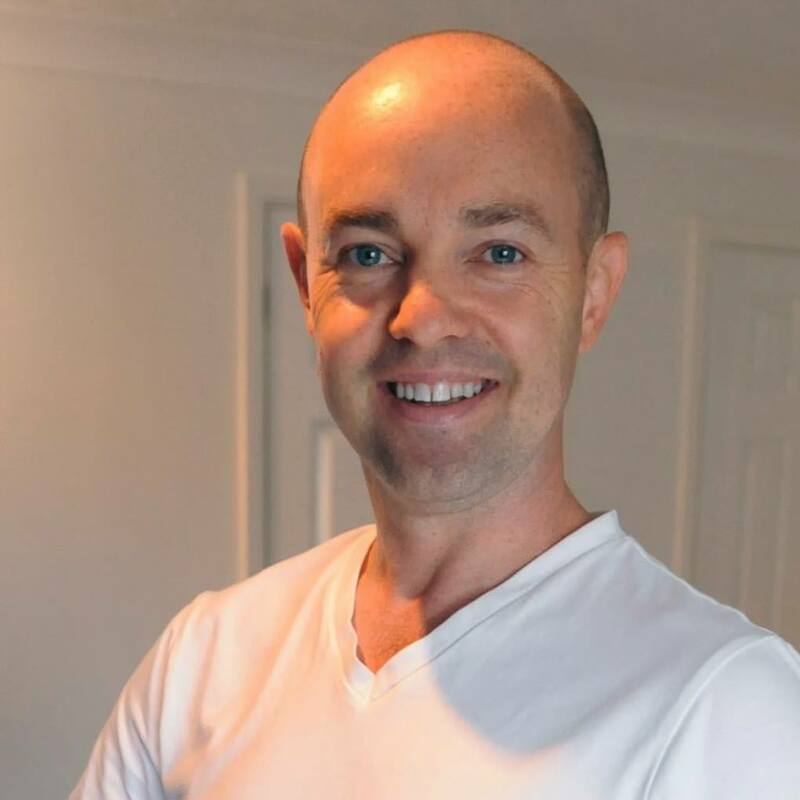 I’ve since gone on to have more work published in many more national newspapers and magazines. I really enjoy seeing my images in print. Against strong competition from 1000’s of entries, I was awarded Runner-Up in the VisitWiltshire/Wiltshire Life 2014 photography competition – This was the first photography competition I ever competed in. Also in 2014, I was short-listed in the ‘At The Waters Edge’ category in the prestigious OPOTY (Outdoor Photographer Of The Year) competition. 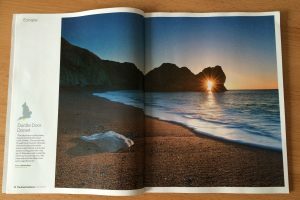 2015 saw my Durdle Door sunrise featured in pretty much every UK national newspaper as well as the cover of the Ordnance Survey map for Dorset! More recently, I’ve entered less competitions. But photography remains a huge passion of mine and I’m enjoying every moment that I’m able to head out with my camera. 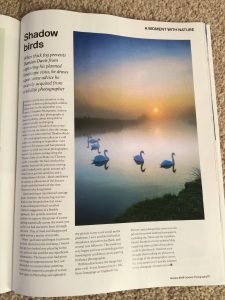 I was delighted to have my ‘Shadow Birds’ image featured in Outdoor Photography Magazine (Jan 2015 | Issue 77). I was asked to write a short article to accompany the image for the full-page feature ‘A Moment With Nature’, which I did with immense pleasure and pride. One of my biggest honours was being asked to supply the cover image to my brother, Kieran Davis, for his debut collection of poetry (published by Black Pear Press). 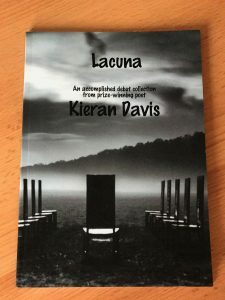 Lacuna is available to buy from Amazon and other good book stores. Durdle Door again – This time on the cover of a map! 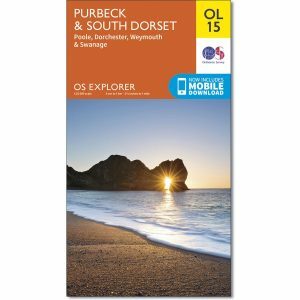 My image of the sun rising through the famous limestone arch made it onto the cover of OS Explorer map OL15 for Purbeck & South Dorset.